When my daughter Hadley was nine months old, she was diagnosed with a dairy allergy. Thankfully, it doesn’t involve anaphylactic shock, and there is a good chance that she could grow out of her allergy by the time she goes to school. For the last year and a half, we’ve managed to work around things. My husband and I can typically come up with a dairy alternative for most dinners and restaurants really are willing to accommodate such dietary needs. The day-to-day has gotten pretty routine for us. We pack her lunch and send her off to daycare where we have an excellent support system in place. They’re well-versed on what to do if she comes into contact with a stray Goldfish cracker or piece of cheese. But life seems to be getting more complicated. She’s growing up and now actually noticing what others are eating. “Is Mommy eating a piece of cheese? Well I want one too.” We certainly have to sneak things more on the sly. The ice cream in our house doesn’t get scooped until after our toddler’s bedtime. Life with a two year-old includes daycare holiday parties, play dates with little friends and birthday parties, and they all present new challenges to us. 1. Don’t be afraid to speak up. Yes, it may come across as rude sometimes, but I’d rather be forward with people about her allergy rather than having to leave a party or other event because she gets sick. Ask if the crackers contain dairy or if the cupcakes have butter in them. Yes, it can be a real hassle, but its what life is right now. 2. Come prepared. If I don’t know a party’s host real well or if I know they’re unaware of Hadley’s allergy, then I’ll make sure to bring a sandwich or something else that I know she’ll eat. I try to include something she doesn’t get often (like potato chips) so that she’s still getting a treat while missing out on some pizza or macaroni and cheese. Also if we don’t know the hosts, then I always bring her a dessert. At some point, all the kids will be diving into a slab of cake and it will most likely be off limits to my little one. I’ll bring some Oreos (which are surprisingly dairy-free) or other cookies so she doesn’t feel left out. 3. Give your toddler some ownership of what they can eat and drink. Hadley has a special spot in our refrigerator where she knows that “her milk” is. When she asks for a drink, she knows that its “Hadley’s milk” (which is really almond milk) and not to touch Mommy and Daddy’s milk. We typically have a cup in the fridge with her milk in it so she knows that’s just for her. Plus, it makes her feel like a big girl getting it out of the fridge herself. Finally, one resource for dairy-free living with kids that I’ve found super helpful is “The Food Allergy Mama’s Baking Book.” It contains lots of great recipes (pancakes, waffles, muffins) that serve as great alternatives that our whole family can enjoy. Enter by using the Rafflecopter entry form below. Contest ends Tuesday, Feb 26, Midnight EST. If you do not see the entry form, please refresh the page or email contests@namebubbles.com to be entered in the contest. Name Bubbles Has Been Nominated! I would love these for my sons allergenic needs. These would be perfect for spring!! My favorite thing about spring is PICNICS!!! This would be an awesome picnic aide!!!! Name Bubbles Rock!! We use them on all our ski gear (Kid, Mom & Dad), school clothes, camp clothes, and swim gear. Bubbles are stuck on our lunch box, water bottles and food storage containers… We gave Name Bubbles to our elderly in-laws for the occasional hospital stay. Bubbles Bubbles Everywhere!! My only complaint?? I wish I had thought of them!! Good advice! So far so good with my babies, but I deal with a major food allergy myself. I LOVE your allergy alert labels!! We use them on all of my son’s items from everything he takes in his lunch to his backpack, etc. Our favorite thing about spring is playing outside! My son as well has a milk allergy…as well as nuts, soy, fish, eggs, bananas, sweet peas and watermelon. Unfortunately, he does require an epi pen because he goes into anaphylactic shock with exposure to milk and eggs. Some allergy alert labels would be awesome for him! I love Name Bubbles – we used them for daycare and preschool for our oldest daughter. Now we use them for our many-allergies youngest daughter! The write-on labels are also great for kids cubbies at school! Thank you for these amazing products – well worth the $$! Name bubbles work fantastically well on all of my daughters’ clothes and gear! Spring means rain and puddles for my munchkin and I to jump through! My favorite part about Spring is Easter. It’s my favorite holiday. Son with multiple food allergies just started Montessori and that is how I came across Name Bubbles as they want all his clothing labeled. Saw this article on allergies and of course it caught my attention. Having a child with food allergies can be very challenging but I can definitely say he is a happy eater and a healthy eater as well! What I love about Spring? I love the weather because it gives us more time for outdoor play and exploration! What I love about Spring? Been able to spend more time outdoor having fun with my little one. flowers and fresh spring air. We NEEEEEEEEEEED labels! We havent had our son yet but these are a must for when he starts daycare! Pick us, pick us! Mr. Hudson is due March 25, 2013!! The spring designs are amazing! 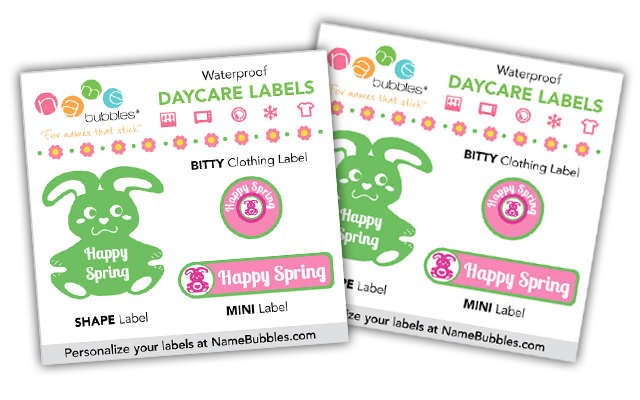 Name Bubbles are the only labels I use for all of my children’s things…backpacks, bottles, clothing, shoes, supplies, blankets..you name it, Name Bubbles are on it! i LOVE spring picnics, and these new labels would be perfect for them! I love spring picnics and these labels would be PERFECT for them!! !